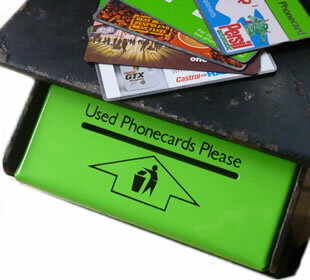 British Telecom (BT) installed green bins in the majority of their cardphone kiosks to provide customers with a place to dispose of their used BT Phonecard. Once a BT Phonecard's units (optical cards) or credit (later chip cards) had been completely used and unlike BT's Chargecard the card served no purpose... except to Phonecard collectors. So to help prevent used BT Phonecards littering the floor of a telephone box and/or the pavements outside the kiosk, BT provided a bin in which their used telephone cards could be disposed of responsible. Of course to collectors these bins were a source of cards for their collection and potentially with the right find a nice tidy windfall too. Pictured left - BT Phonecard payphone kiosk complete with "Used Phonecards Please" green disposal bin. The green bins (to match the BT Phonecard 'green' colour) while not locked, required the use of a special tool, which the BT engineer or contract cleaner would slide between the top of the black shelf and top of the green bin to push down two prongs located at the back of the bin to safely open it. Collectors who collected via the bins soon found ways of opening them and over the years BT engineers took on more imaginative and cunning ways to secure them - a bit of a cat and mouse story. 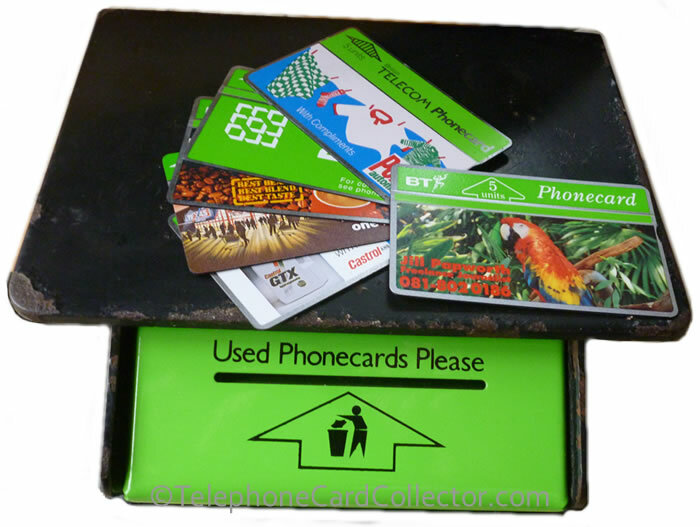 Eventually British Telecom decided to completely remove the "Used Phonecards Please" green bins from all of their telephone kiosks citing the decision was for 'hygiene reasons'. What was your experience of BT's green bins? Please contact me and let me know, so I can add your story to this page. My reputation as a 'card searcher on a bike' is known far and wide in the remote areas of Bournemouth, Inverness, and even Spalding, as well as my usual "territory" of North West London. At first, in my greener days, I did not realise that it was possible to open green bins. The first one I opened yielded an otter (BTC027), my first picture card, apart from the Ideal Home Exhibition cards (BTA029), which were everywhere in early 1991. My Finchley otter was soon surpassed by a bin on the Edgware Road where I found nine cards, all pictures and mostly Christmas 1990 (BTC029-031). Alas, this kiosk was the one blown up by the IRA. Occasionally, bins in London would yield a large number of cards, like two neighbouring kiosks in the White City area, which produced 105 and 119 cards in the space of five minutes. I mentioned Inverness, where I had my largest haul from one bin, which was so crammed that the top cards were all bent where they had been forced in. I threw away 30 cards, but kept the other 180. They were mainly 'greenies' N.C.H. (BTC066-071), and Cornflakes (BTA045), there was little of great interest. The best individual card that I found was in Bayswater in 1994. This was a British Airways, backprinted 20unit definitive. A phonecard trader, renowned for his tight-fisted nature, offered me £175 for it, saying that it was worth £250 and that only 12 were known of. He was collecting aeroplane related cards, but he didn't get that one. My best ever find, even better than two Nifensar (BTM007), has to be from a box in Willesden Green, which has long since disappeared. I found a Poggenpohl, which no-one knew anything about! If you look in the catalogue (BTP339), it has a much earlier control number than the cards around it. A week later I returned to the same box and found another nine of them! 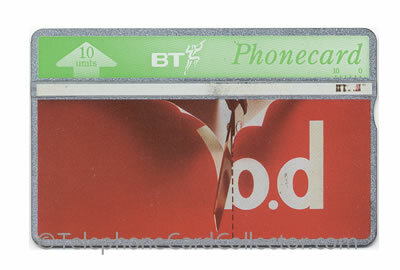 Pictured above - a nine find in a BT green bin, a used BTM007 Nifensar BT Phonecard. Large numbers of cards in the bins seems to be only a memory now. As late as October 1997, I cleared 70 cards from a kiosk in a back street of Edgware, which hadn't been touched since it was converted to chip cards. My highest number of cards last year (1998) was a mere 17, jointly held by two bins. As the bins are still there, I won't tell where they are. However, I have a friendly dustbin from which, early last year, I fished out 25 cards in one go, including 13 of the Istin chip card (PRO097). It can be very frustrating looking for cards. On one of my lengthy Middlesex runs, I returned home in the middle of the night with a lot of non-entities, except for one card with no control and 90% of the picture rubbed off. It turned out to be a squirrel (BTC028) and that's not the only time that the decent card found has been damaged. However, I keep telling myself that if you don't look, you won't find anything and, eventually, if you look long and hard enough, you will find a nice reward. I know of other early collectors who, in the late 1980s regularly exceeded my record of 210 cards in one bin. The above story first appeared in Phonecard Collector magazine issue 52 - Jan/Feb 1999. The following story first appeared in Phonecard Collector magazine issue 15 - Dec 1992 / Jan 1993. Reports from various collectors, of their finding certain of the green boxes, which have (for lack of a better word) been "adapted" by what would appear to be certain employees of BT, have been made to me over the past couple of months, and, having now gone out of my way to check these, I am sad to admit that they are substantiated. 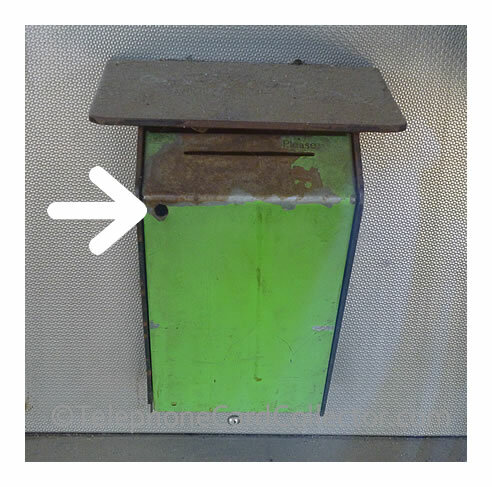 A good number of phonecard kiosks, sporting these green green boxes, have had a hole drilled through the back side-wall of the frame containing the green box, and a special screw made of hardened steel, has been inserted and screwed through, right into the side of the green box. This, most effectively, holds the box securely shut, so that not even the duly-authorised cleaners can open the box and remove the contents. Apparently, it is the aim of such "adaptors" to claim the contents of these particular boxes for themselves and thus, by this method, prevent anyone else from opening "their" boxes. As far as I know, BT's official attiude to unauthorised opening of these green boxes remains rather cloudy, but, in most cases, it would appear that this, whislt not condoned, is tolerated as long as no damage is made. What then, will BT's attitude be to this presumably unathorised "adaptation" of such boxes be, since it obviously involves damage? Insofar as collectors, in general, are concerned, I was always undrer the impression that the contents of ANY box whatsoever/wheresoever could NOT by any stretch of the imagination, be called the "sole property" of any particular individual, or group. Yet, here we have such a premise. Pictured right - An adapted/secured BT used Phonecard bin. A hole next to the 'white arrow' was drilled and a screw/bolt added right at the back of the green bin. To open, a very long handled screw driver was first required. Click the image for a larger view. Perhaps I have been wrong all this time: perhaps I should now creep out, at the dead of night, bend up the catches on a number of boxes near my home or otherwise "adapt" them so that only I can open them, and thus secure my own supply of phonecards! OK, I would not lower myself to such levels, but there are obviously some amongst us who have already done so! Did you come across secured green bins like the one above? If so, please contact me so I can share your story. My best finds in green bins are not very exciting I'm afraid, although I remember the exact bins I found then in and cannot drive past without remembering the occasion. I used to go into London on a railway travel card with my two sons aged 13 and 12 on a scheme called "kids out quids in" which meant if you bought an adult ticket children went for £1 each. When we arrived in London we would all go our separate ways opening every bin we could find. When we met we would have four or five carrier bags full and we'd go home and sort them out. ‣a) Two 3i Connections (BTP002) in one bin, both with no control number, at Shepherds Bush. ‣b) Two green cards in one bin both with the notch on the wrong side at Wembley (these are quite rare, I only ever found 5). ‣c) A Winter 1989 100 unit "stag" (BTC013) with upright control in Watford - this is a particularly rare card because just 600 were made in Switzerland, prior to the main issue of 150,400 made in UK with inverted controls. They were just sold as normal cards so most were used and thrown away. I've never seen another one although they must be around. ‣d) Three "calling card" type phonecards for the same BT man in a bin in Edgware, north London. I never did find the really rare cards. No Telecom Challenge (BTI002), Muirfield 100 (BTC003) etc. Others did but not me. 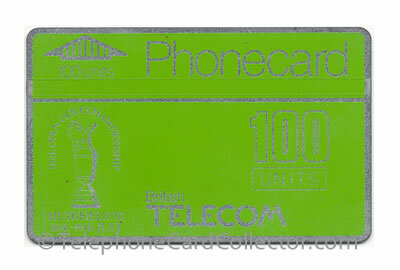 Pictured above - a rare green bin find, a partially used Muirfield Golf 1987 100unit (BTC003) BT Phonecard. From those early days I can certainly say which "scarce" cards were commonly found used and which weren't. It was easy to find used Catlemaine 10 (BTA007), Trebor (BTA003), Glaxo (BTM001), Brooke Bond (BTA009/10) and Mentadent (BTA002), but very difficult to find Gateway (BTA005), Sigmagyr (BTP006) (especially in good condition) Black Bottle (BTA001) and Birds (BTA004). In used condition I would rate a used Birds as worth ten used Trebors even though they used to be the same price when I was collecting. Discover how to tell if the Phonecard you have is mint or used. Pictured above - a used Bird's Desserts (BTA004) BT Phonecard, a rarer BT Phonecard find. I started collecting phone cards when PG Tips offered a free one with coupons from their tea packets. I don't know the year but it was a long time back!! Then, like you, I was hooked and collected non-stop for many years. I scoured phone boxes for "cast offs", travelled round shops and post offices to complete sets as they came out and generally pestered friends and family to find more for me. A good friend even got off a bus in Cyprus and picked up some from a phone box by the bus stop and then got back on the bus - how's that for friendship? I always got the monthly phonecard magazine and did their competitions and on my birthday one year complete with my birthday cards, I received a prize win from the magazine - a lovely Marilyn Monroe card - super present. The quoted number e.g. BTC003 within the article above relates to the cards unique designated catalogue number. Over the years these numbers have become extremely well known by collectors. The two latest catalogues UK 1 (pictured right) and UK 2, together feature colour photos and catalogue numbers for the several thousand BT Phonecards that were issued until they were withdrawn in 2002. For more information about the catalogues and to buy online - please see the collector shop. Do you have a similar story of your memories of collecting via the used Phonecard bins, maybe you worked for BT and was tasked with preventing non BT employees from opening them? Either way I'd love for you to get in touch and share your stories, so they can live on and be remembered. Please contact me via my contact page. Follow Telephone Card Collector's board Used Phonecards Please on Pinterest.